This blog post has been a long time coming, well, not this one, but the one that will follow it (with all the nitty gritty details for which you have to request the password). For this post, I’ll attempt to satisfy the blog readers that are just happy with basic before and afters. For everything in between, you’ll have to have full access. Subscribers can refer to the lower level floorplan. This room is the 7 x 7 1/2 bath. This brings me to another interesting piece of un-toolbelt diva-ish advice about what NOT to scrub your floors with, and this should have been obvious. My husband was anxious to get the vanity installed – if you notice, the vanity rests above the floors whereas the old one did not. I wanted to clean the floor underneath where the vanity was going – especially since you never know when you may want to swap something out. I swiftly grabbed whatever was closes to me, which in this case was a paper towel. Yes. You read that right. A paper towel. Not thinking clearly (and it’s 11:30 PM at this time) I start scrubbing, as my husband says “like cinderella late for the ball” on lord-knows-how-old wood floors and within seconds, I felt a sharp shooting pain UNDER my thumb nail. Off to the hospital I go after several attempts by my husband to extract said splinter. I will post this cell phone shot as a thumbnail for the weary, and if those of you brave souls decide you want to actually SEE it? Be my guest! This is after they pumped it full of stuff so I wouldn’t feel the removal. 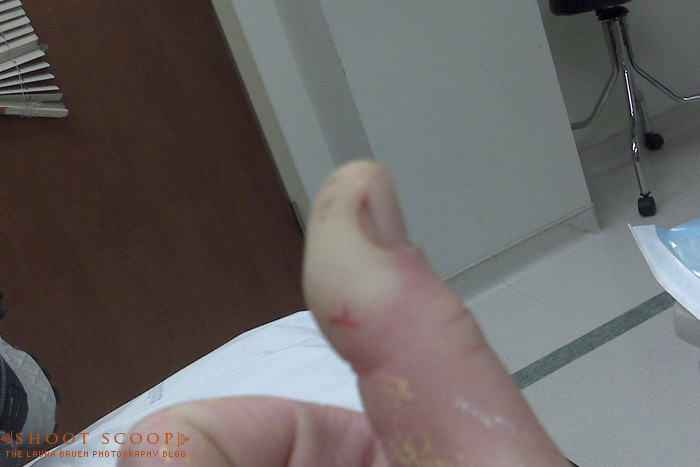 My thumb is not usually this swollen! Really what you want to see here is the dark line underneath my nail. Straight down into my nail bed! Ouch. It was really painful. I really do not have much luck with this thumb. I was laughing the entire time I was in the hospital emergency room, seeing every hour pass. Could not believe I did it! I think I finally left around 2:30 AM. Time to find a mirror. The next day without delay I head over to Red Bank Antiques District. My baby. 18th century France so I’m told. Definitely not in pristine condition – I love the silver that shows through though, so I do not mind the weathered look here – it’s genuine. I love this print. It is completely out of scale of the wall, I need to add more I think…suggestions? I love the print itself but can certainly part with the frame if necessary. I just love the circus theme. The third purchase I can easily part with, but since the bathroom is off of the playroom I thought it appropriate to add vintage with children. I don’t know how I feel about this print and it wasn’t an overly expensive investment, thoughts? I’m new at the whole vintage decor thing – so an additional “hot or not” may in order here. I definitely need better art in this room. Ah, the days when it only cost 2.10 to get to NYC! Sigh. Subscribers, stay tuned for the detail post!